The Oxity Bank Note Road Rallye is a unique motorsport event combining the experience of navigation, speed, and betting action. Contestants will bet on their performance (outcome) of the competition prior to the event. From racing karts, rallying and partying all night at the exclusive club FUR, you will never forget this experience! Mark your calendars for Saturday June 24th and get ready to win up to $15,000.00 USD. 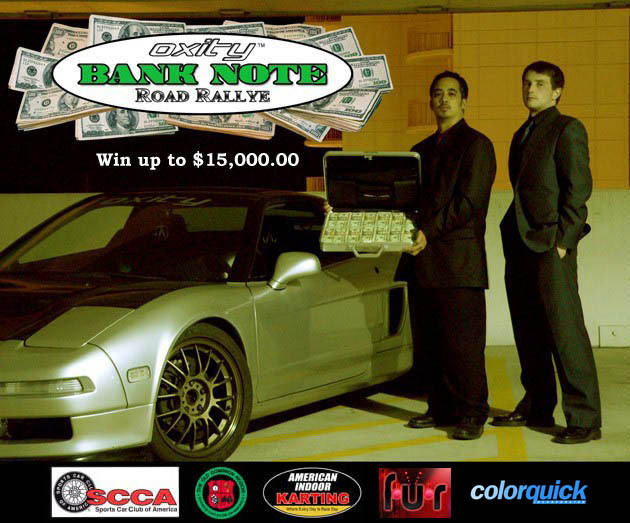 The Oxity Bank Note Road Rallye will begin in Portsmouth, VA at AIK where participants will meet in a car show like fashion and have time to apply numbers and sponsor decals to their windows. After meeting other ralliers and signing in, the karting competition will begin. One person from each team will compete for fastest lap times. Teams will then line up and get ready for the road rallye. With a staggered start, teams will leave one by one and navigate their way through a mix of scenic twisty fun roads and open straights to Washington, D.C. On the way their will be calculated stops for gas and food breaks. Finishing the rallye at Club FUR in D.C. participants will park their rallye cars on the street in front of the club. We have a permit and will have the street closed off for parking for Oxity Bank Note Rallye competitors only. After completing the rallye teams will be directed inside the night club for a night of fun and awards. Henessey declared bank bankrupcy ! Quick Reply: Oxity Bank Rallye!